This is an O.S. #7 Glow Plug. Recently developed to focus on easier running at low and medium speeds, this plug is a slightly hotter heat range than the O.S. #8 plug. This plug is ideal for helicopter engines with superior performance around hovering RPM range, which is critical for smooth and powerful 3D and F3C type flight. Also great all around plug for most 2-stroke standard plug airplane, helicopter and car engines. No.6 Hot Formerly known as the OS A3 plug. This hot plug will provide a more stable idle and crisp acceleration when compared to a cold plug. This plug is recommended for low nitro content fuels and .12 class engines. 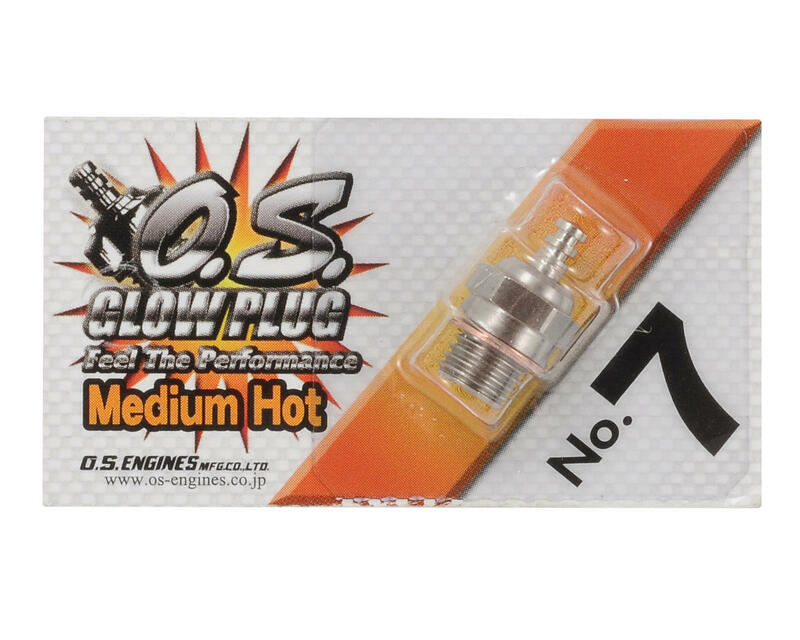 No.7 Medium Hot Slightly "hotter" than the #8 and ideal for the constant "on/off" throttle action in 1/10 and 1/8 scale racing. No.8 Medium A medium heat range plug for 1/8 scale racing and most .12-21 car, boat and truck engines. I have been using these plugs in my SH.28 and works fine. Holds idle well good power range too. I cant tell the difference from the No:8 and this except the price..
O.S. No.10 Short Body Standard Glow Plug "Cold"